When the universe is threatened, when the laws of time, space and reality break down, different incarnations of the Doctor can meet. It should never happen, but this is one of those days! Witness an unprecedented crossover between all thirteen Doctors to date, in an epic struggle for the future of the universe – guest-starring Jenny, the Doctor’s daughter! 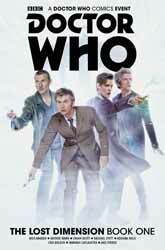 The Doctors must battle an all-consuming white hole – and uncover the deadly secret of the void between universes! Writers George Mann (Dark Souls), Cavan Scott (Tekken) and Nick Abadzis (Pigs Might Fly), with artists including Rachael Stott (Star Trek), Adriana Melo (Star Wars), Mariano Laclaustra, Leandro Casco and many more chart a jaw-dropping course for the impossible…! Titan’s previous Doctor Who crossovers, Four Doctors and Supremacy of the Cybermen, each ran to five issues. The Lost Dimension manages to expand its scope to eight, by also incorporating one issue each from the ongoing runs of Tenth, Eleventh and Twelfth Doctor adventures. This means that the whole story is too big to fit in just one graphic novel, so this volume, the first of two, collects the first four issues of the saga: Alpha, The Ninth Doctor Special, The Tenth Doctor #3.9 and The Eleventh Doctor #3.10. Writers George Mann and Cavan Scott pack plenty of plotlines into their opening chapter. It kicks off with Ninth Doctor companions Captain Jack Harkness and Tara Mishra facing planetary destruction owing to the effect of a devastating white hole, before cutting between the Twelfth Doctor and his two immediate predecessors to see how the dimensional instability is affecting them as well. As with the anniversary episode The Day of the Doctor, the new series incarnations are very much the stars of the show, with the classic Doctors confined to cameo appearances (in this volume, anyway). Nevertheless, the writers cram in lots of fan-pleasing moments and sly in-jokes, such as the comic-book debut of Nardole, Bill Potts finding the Doctor in the Terrance Dicks library, a portrait of Queen Victoria in the likeness of Jenna Coleman, the return of UNIT, and Jenny, the Doctor’s daughter, being rescued by her dad, in the form of the Fifth Doctor (in real life, of course, Jenny was played by Georgia Moffett, the daughter of Peter Davison). There are some sensible art choices in this initial instalment, with Ninth Doctor artist Cris Bolson providing the Jack and Tara pages, and Twelfth Doctor regular Rachael Stott dealing with most of the action on the campus of St Luke’s University. Stott also handles material involving the Fifth, Tenth and Eleventh Doctors. However, seemingly at random, other artists (Pasquale Qualano, Elton Thomasi, Klebs Junior and J.B. Bastos) pitch in to do a page or two here and there. This results in a significant breakdown of continuity on the final page, where characters switch positions and the Twelfth Doctor gets a new hairdo. Colourist Rod Fernandes does what he can to hide the join. After the multiple timelines of the first chapter, readers must adjust to a change of pace – and the fact that the Twelfth Doctor’s story will not be resumed until Book Two – as the next three issues focus upon the adventures of one Doctor apiece. First up is Number Nine, who crosses paths with Madame Vastra – and it quickly becomes clear that these two have met before. Writer Cavan Scott addresses some continuity issues (explaining that the Silurians of the classic series are from a different caste to those of the new) while creating a few of his own (despite having met the Ninth Doctor, Jenny Flint seems not to recognise the TARDIS or be aware of the process of regeneration in her Eleventh and Twelfth Doctor episodes). The main setting of this instalment, a Silurian base discovered by the Sixth Doctor on an equatorial island during the 19th century, is comparable to that of the audio drama Bloodtide, but located on the opposite side of the world. Adriana Melo and Cris Bolson share out the art duties very much in the style of a sandwich, with Melo providing the ‘bread’ of the outside pages and Bolson doing the ‘filling’ in the middle. Mariano Laclaustra, an artist usually associated with the Twelfth Doctor comics, proves to be an excellent choice to illustrate the Tenth Doctor’s episode, which is up next. His smooth lines work well with Ten’s younger features – though he also gets to put a few wrinkles on the faces of a seasoned space station commander and a couple of alien crewmembers, not to mention the Third Doctor, who appears fleetingly. Textually, though, this instalment is the weakest link in the collection. It sees the Cybermen return far too soon after their recent outings in Supremacy of the Cybermen and Sin Eaters. Nick Abadzis’s script is also hampered by verbose, jargon-laden speeches, such as this one from the Doctor: “What’s the problem? Power beam destabilized by a magnetar crust shift? Playing havoc with your hyperspace corridor? More radiation than your power converters can handle? That’s the problem with trying to harvest the energy of any stellar remnant…” The real science is intriguing, however – for example, a magnetar is a neutron star with an exceptionally powerful magnetic field (I see on Wikipedia). Surprisingly, Abadzis, who normally writes for the Tenth Doctor, then turns his hand to the Eleventh in the following chapter, which I enjoyed more. There is still some technobabble, some of which isn’t even spelled correctly (“infintesimably” should read “infinitesimally”, and “probablity” should read “probability”), but the writer does a good job of capturing Eleven’s endearingly scatterbrained mode of speech: “Don’t worry! I’ve done this before! The interior dimensions won’t be affected… much.” This instalment also develops the series mythology in a way that should prove especially enticing to fans of the Seventh Doctor novels from the 1990s. What lets this episode down is its art, by Leandro Casco and J.B. Bastos. There are some very unrealistic and amateurish poses, and inconsistent likenesses, particularly towards the end of the tale (I think these are Bastos’s pages). Sometimes the ruler of the impossible planet on which the Doctor and Alice have landed resembles Timothy Dalton, while at other times he looks more like Bernard Horsfall. A couple of surprise additions to the back of this graphic novel are Jenny and Alice’s stories from Special #2, which was actually the seventh issue in the Lost Dimension miniseries. Despite ‘jumping ahead’ in this manner, the two stories are appropriate inclusions in this volume. Alice’s two-page epilogue (which is drawn by I.N.J. Culbard) is the natural successor to the Eleventh Doctor chapter, while Jenny’s eleven-page excursion (boasting a cohesive blend of artwork from Carlos Reno, Elton Thomasi, Rafael Dantas and Adriano Vicente) is a flashback that picks up right where The Doctor’s Daughter left off. In my opinion, Jenny’s story would have been better placed near the beginning of the book (some time during the first episode) rather than towards the end. Actually, that’s not my only issue with the sequence of events in this saga. Time is relative, of course, especially in Doctor Who, but personally I would have preferred the Ninth Doctor’s chapter to swap places with the Fourth Doctor’s from the start of the next volume. The events clearly unfold in that order from the Fourth Doctor’s point of view, or so it seems to me, while the Silurian elements of the Ninth Doctor’s tale would gel better with River Song’s storyline in the subsequent compilation.